The PM says he is working in "accordance with the law". CANBERRA - Despite championing "transparency, accountability and integrity" in a scene-setting speech, Prime Minister Malcolm Turnbull has refused to disclose a much-awaited personal political donation to the Liberal Party's election war chest. A periodic dump of data on donations released Wednesday from the Australian Electoral Commission (AEC) has revealed the federal Liberal Party, at the reporting date of June 30 2016, was nearly $12 million in debt. 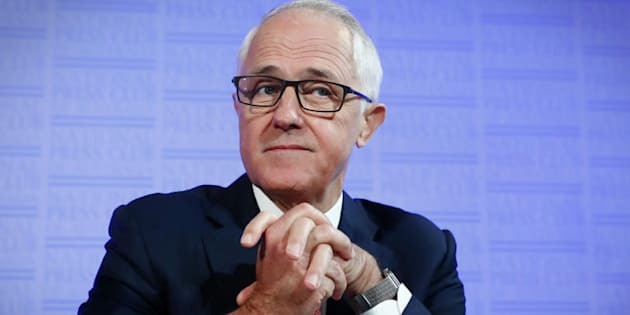 Turnbull's financial assistance - which he has not personally confirmed, but is believed to be in the ballpark of $1 million - is not to been seen in the latest AEC returns and he side-stepped a face-to-face entreaty from journalists at the National Press Club (NPC) Wednesday. "My donations to the Liberal Party have been regular and generous and I encourage others to do the same!" the Prime Minister said. Malcolm Turnbull says he supports greater transparency for political donations, just not his own. Speechless. The NPC crowd filled with government ministers, staffers and journalists broke into laughter and so Turnbull said with a smile; "And they've always been disclosed in accordance with the law." In accordance with the law is what Turnbull has said before. And he is right. He may have held back his alleged Liberal Party bankroll until after the official reporting period ended on June 30, but he is working within the rules. The Prime Minister has indicated he actually backs real-time donation disclosures, a measure championed by Senator Nick Xenophon to fix problems and perceptions issues with the current political donation system. "I would have no objection to that," he said. "It is being looked at by the joint standing committee on electoral matters." So he has no problem with donation disclosures, but won't disclose. Earlier, in his speech, the Prime Minister championed his move to reforms of the political travel entitlements scheme in the wake of the still unresolved Sussan Ley expenses controversy, calling his efforts the "biggest reforms to the management of parliamentarians' expenses in more than a generation". "The new system will be overseen by an Independent Parliamentary Expenses Authority and politicians' expenses will be released publicly each month," Turnbull said. "These reforms speak to the heart of Liberal values - transparency, accountability and integrity." Turnbull also raised donation reform in his speech, but only concern about foreign political donations. "I believe Australians expect us to ensure that only Australians and Australian businesses can seek to influence Australian elections," he declared. "Whether via a political party, an activist group (like GetUp) or an association or union." Under current rules, all political donations over $13,000 must be disclosed. The threshold means many reasonably large amounts remain secret. Labor wants the disclosure threshold lowered to $1,000 while the Greens are insisting on wholesale donations reform.